[dropcap]R[/dropcap]egular readers of EMR will be familiar with my reports from this most engaging of early music festivals, both online and formerly in print. The 2018 edition indeed represented something of a personal milestone, it marking my tenth visit to the small town of Ambronay, nestling beneath the pre-Alpine foothills of the Haut Bugey. At its heart lies the mainly 13th-century Abattiale (abbey) with its extensive attendant buildings, today the home of a centre cultural rencontre and venue of the principal concerts of the annual festival held over four autumn weekends. The 2018 festival adopted the theme ‘Vibrations Cosmos’, as usual with such appendages a sufficiently vague umbrella to be open to fairly flexible interpretation. Obvious standout events included Handel’s Il trionfo del tempo e del disinganno under René Jacobs and Acis and Galatea with Le Banquet Céleste; Gesualdo’s Tenebrae Responses sung by Les Arts Florissants; and the first modern performance of Destouches’ tragédie en musique Sémiramis, given by Les Ombres under the direction of Margaux Blanchard and Sylvain Sartre. This year we attended the second weekend of the festival (21-23 September), the first concert of which brought renewed acquaintance with Vox Luminis, who we’d heard at the Saintes Festival only weeks before (a report of that festival can be found on this site). Indeed this vocal ensemble, directed from within the group by bass Lionel Meunier, has in recent years become ubiquitous in French early music circles. The reasons are not hard to determine. The ensemble appears settled on three singers to a part, all soloists in their own right but also capable of producing a well balanced ensemble and well-focussed singing. On this occasion these qualities were particularly in evidence in the youthful vitality and brilliance of Handel’s Dixit Dominus, a work it is virtually impossible not to succeed with. If the opening has been given with more verve – there was a slightly tentative entry at ‘donec ponem’ in the opening ‘Dixit’ – this was from both orchestra and chorus an exciting performance, with a thrilling climax to the first part of ‘Dominus a dextris’, for example. As at Saintes, however, both here and in the Bach Magnificat that followed I found Meunier’s habit of taking his vocal ensemble off-stage during solo numbers both an affectation and distracting. The Bach was not quite as satisfying. Whatever feelings you may have about one-per-part Bach choirs, three strikes me as an unsatisfactory compromise since it leads almost inevitably to untidy moments, especially when the conductor is one of the singers, the magnificent opening ‘Magnificat’ itself lacking incisiveness. But elsewhere there was some sensitive singing at ‘Quia respexit’ and an impressively committed ‘Deposuit’ from the tenor soloist. The orchestra was excellent throughout. An unscheduled tumble that required patching up repairs meant that I unfortunately missed the following afternoon’s concert devoted to 18th-century Scottish music performed by tenor Robert Getchell and Les Musiciens de Saint –Julien. I heard good reports of it. 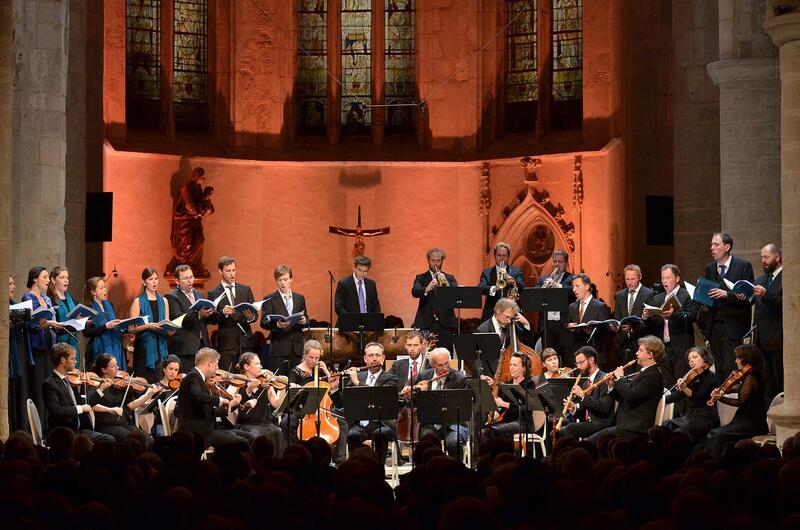 The evening brought a concert that did unquestionably tie in with the theme of the festival, a superbly devised programme based around the life and times of the Renaissance mathematician and astronomer Nicolaus Copernicus (1473-1543). 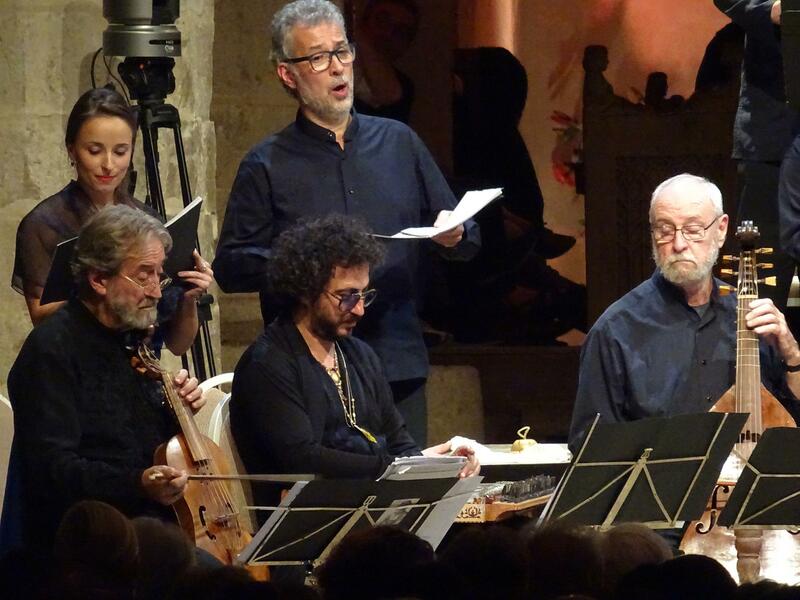 It was given by the inimitable Jordi Savall and a substantial Hespèrion XXI instrumental ensemble of viols, wind, keyboard and percussion, along with a six-voice Capella Reial de Catalunya vocal ensemble. Given that Copernicus was born and died in Poland, La Capella Reial appropriately on this occasion consisted mainly of Polish singers, including the soprano Aldona Bartnik and mezzo Ewa Puchalska, both outstanding singers who contributed significantly. From the outset, a rousing, noisy celebration of the Peace of Torun (Copernicus’ birthplace) in 1466, the concert was nothing less than an utterly absorbing European history lesson in music, taking in such events as the 1515 Congress of Vienna, illustrated by Senfl’s take on the famous song ‘Fortuna desperata’, Luther’s 95 theses (a wonderful performance of Heinrich Isaac’s ‘Christ ist erstunden’) and climaxing with the publication in the year of his death of Copernicus’ De revolutionibus orbium coelestium (On the Revolutions of the Celestial Spheres). This was represented by ‘Omnus mundus jocundetur’, an irresistible Polish Christamas song so beguiling it was repeated as an encore. It is a measure of Savall’s genius as musician and communicator that the version heard in the encore differed completely. But doing full justice to this enthralling evening without testing the patience of anyone simply reading about it would be nigh on impossible. The final day of our visit again included afternoon and (early) evening concerts. The latter took the form of what turned out to be a glorious performance of Acis and Galatea given by another of France’s outstanding early music ensembles. But that I’ve written about elsewhere (Opera), I’m afraid, so that just leaves the earlier event, given in the Salle Monteverdi, the abbey’s smaller concert room. Given by Ensemble La Vaghezza, one of the groups participating in the eeemerging programme supported by Ambronay, it consisted of 17th Italian works by composers such Biagio Marini and Dario Castello for one or (mostly) two violins and continuo. Sadly, here was another group of technically accomplished young players whose performances make no attempt to distinguish between 17th- and 18th-century styles, playing instruments neither set up nor bowed correctly for earlier Baroque string music. The result was heavily-textured performances begging for a lighter, airier touch and some recognition of the sprezzatura, or element of careless fantasy, that brings this music to life. In short, what should have been soufflé was more like suet pudding and as such became wearisome to the ear long before the concert came to an end. This is not the first time I have felt the necessity to write in this vein on this topic; it continues to puzzle me why young performers who feel drawn to this repertoire do not investigate a more appropriate, historically informed style of performance. But this report must not be allowed to conclude in discord. The Ambronay Festival remains one the most hospitable and vibrant of early music festivals; may it continue to be so long after my much-anticipated visits finally come to an end.